Jeremy Staunton is an Irish fly-half who currently plays for Leicester Tigers. Staunton's progression through junior rugby in Ireland led him to secure a contract with Munster. However with first-team opportunities limited behind Ronan O'Gara, Staunton move to England and Harlequins in the summer of 2004. 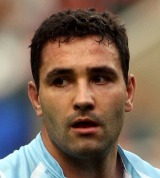 After 23 appearances for the Quins he joined London Wasps a year later. He spent two seasons at Wasps but again struggled to nail down a starting jersey. Although, his time at High Wycombe included a Powergen Cup winner's medal in 2006. Staunton toured New Zealand and Australia with Ireland in the summer of 2006. And toured Argentina with the national team a year later. He signed for London Irish at the end of the 2006/07 season only to return on loan to Wasps in February 2008 and stayed with Wasps for the following season. He moved to Leicester in the summer of 2009 and scored 172 points during the season. He was forced to share the role of understudy to Toby Flood with Billy Twelvetrees after the young fly-half's emergence, but his perfomances were consistently good enough to earn a contract extention until 2012.